The World Customs Organization (WCO) is an intergovernmental organization headquartered in Brussels, Belgium. The WCO is noted for its work in areas covering the development of international conventions, instruments, and tools on topics such as commodity classification, valuation, rules of origin, collection of customs revenue, supply chain security, international trade facilitation, customs enforcement activities, combating counterfeiting in support of Intellectual Property Rights (IPR), drugs enforcement, illegal weapons trading, integrity promotion, and delivering sustainable capacity building to assist with customs reforms and modernization. The WCO maintains the international Harmonized System (HS) goods nomenclature, and administers the technical aspects of the World Trade Organization (WTO) Agreements on Customs Valuation and Rules of Origin. On August 23, 1947, the Committee for European Economic Cooperation created a European Customs Union Study Group (ECUSG) to examine economic and technical issues of inter-European Customs Union concerning the rules of the General Agreement on Tariffs and Trade (GATT). In total, six ECUSG meetings were held in four years from November 1947 to June 1950 . This work of ECUSG led to the adoption in 1950 of the Convention establishing the Customs Co-operation Council (CCC), which was signed in Brussels. On January 26, 1953, the CCC’s inaugural session took place with the participation of 17 founding members. CCC membership subsequently expanded to cover all regions of the globe. In 1994, the organization adopted its current name, the World Customs Organization. Today, WCO members are responsible for customs controls in 182 countries representing more than 98 per cent of all international trade. The WCO is internationally acknowledged as the global centre of customs expertise and plays a leading role in the discussion, development, promotion and implementation of modern customs systems and procedures. It is responsive to the needs of its members and its strategic environment, and its instruments and best-practice approaches are recognized as the basis for sound customs administration throughout the world. 1) The International Convention on the Harmonized Commodity Description and Coding System (HS Convention) was adopted in 1983 and came into force in 1988. The HS multipurpose goods nomenclature is used as the basis for customs tariffs and for the compilation of international trade statistics. It comprises about 5,000 commodity groups, each identified by a six digit code arranged in a legal and logical structure with well-defined rules to achieve uniform classification. The HS is also used for many other purposes involving trade policy, rules of origin, monitoring of controlled goods, internal taxes, freight tariffs, transport statistics, quota controls, price monitoring, compilation of national accounts, and economic research and analysis. 2) The International Convention on the Simplification and Harmonization of Customs procedures (revised Kyoto Convention or RKC) was originally adopted in 1974 and was subsequently revised in 1999; the revised Kyoto Convention came into force in 2006. The RKC comprises several key governing principles: transparency and predictability of customs controls; standardization and simplification of the goods declaration and supporting documents; simplified procedures for authorized persons; maximum use of information technology; minimum necessary customs control to ensure compliance with regulations; use of risk management and audit based controls; coordinated interventions with other border agencies; and a partnership with the trade. It promotes trade facilitation and effective controls through its legal provisions that detail the application of simple yet efficient procedures and also contains new and obligatory rules for its application. The WCO revised Kyoto Convention is sometimes confused with the Kyoto Protocol, which is a protocol to the United Nations Framework Convention on Climate Change (UNFCCC or FCCC). 3) ATA Convention and the Convention on Temporary Admission (Istanbul Convention). Both the ATA Convention and the Istanbul Convention are WCO instruments governing temporary admission of goods. The ATA system, which is integral to both Conventions, allows the free movement of goods across frontiers and their temporary admission into a customs territory with relief from duties and taxes. The goods are covered by a single document known as the ATA carnet that is secured by an international guarantee system. 4) The Arusha Declaration on Customs Integrity was adopted in 1993 and revised in 2003. The Arusha Declaration is a non-binding instrument which provides a number of basic principles to promote integrity and combat corruption within customs administrations. 5) The SAFE Framework of Standards to Secure and Facilitate Global Trade was adopted in 2005. The SAFE Framework is a non-binding instrument that contains supply chain security and facilitation standards for goods being traded internationally, enables integrated supply chain management for all modes of transport, strengthens networking arrangements between customs administrations to improve their capability to detect high-risk consignments, promotes cooperation between customs and the business community through the Authorized Economic Operator (AEO) concept, and champions the seamless movement of goods through secure international trade supply chains. 6) The Columbus Program is a customs capacity building program works to promote customs modernization and implementation of their standards to secure and facilitate world trade. In 2005, the WCO adopted the Framework of Standards to Secure and Facilitate Global Trade, an international customs instrument containing 17 standards that promotes security and facilitation of the international supply chain. Because of its complexity, the WCO launched a capacity building program called the Columbus Programme which focuses on needs assessments for WCO Members using the WCO Diagnostic Framework tool. The WCO defines capacity building as "activities which strengthen the knowledge, abilities, skills and behaviour of individuals and improve institutional structures and processes such that the organization can efficiently meet its mission and goals in a sustainable way." The WCO Secretariat is headed by a Secretary General, who is elected by the WCO membership to a five-year term. 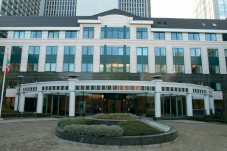 The current WCO Secretary General is Kunio Mikuriya from Japan, who took office on 1 January 2009. The WCO is governed by the Council, which brings together all Members of the Organization once a year, in a meeting chaired by an elected Chairperson. Additional strategic and management guidance is provided by the Policy Commission and the Finance Committee. Several WCO committees, such as the Harmonized System Committee, the Permanent Technical Committee, the Technical Committee on Customs Valuation, Technical Committee on Rules of Origin, the Capacity Building Committee, and the SAFE Working Group, provide a platform for developing instruments and best practices on customs competencies. ^ Kormych, Borys. "THE EUROPEAN CUSTOMS UNION STUDY GROUP: DRAFTING THE EU CUSTOMS LAW". Wikimedia Commons has media related to World Customs Organization.